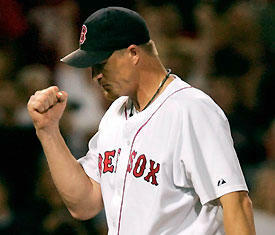 Mike Timlin celebrates a Red Sox win! In light of the controversy surrounding the incident in Washington, DC where our Baseball Chapel leader, Jon Moeller, had his credentials revoked, I thought the following Boston Globe article would shed some light on what really happens in a chapel service. I'm reserving judgment on the Washington Nationals' situation until things are cleared up at the request of the President and Board of Baseball Chapel. Please note what Gabe Kapler says about the "chemistry" on the Red Sox team. He said it well! They gathered in a makeshift house of God -- a brick-walled retreat in Fenway Park otherwise reserved for postgame interviews -- and prayed for dead and dying loved ones. They prayed for American troops in hot spots abroad. And for the poor souls in the path of Hurricane Katrina. As the Sunday baseball crowd streamed into the park less than an hour before the defending world champions played their 128th game of the season, a dozen members of the Red Sox -- the largest group of evangelical Christians on any team in Major League Baseball -- joined an equal number of coaches and staffers in sharing a bond of faith that is fast becoming the stuff of national renown among religious figures in sports. The service was conducted by the Rev. Walt Day of Baseball Chapel, a ministry that provides all 30 major league teams with a chaplain. Moments earlier, Day had turned a stuffy storage room in the visitors clubhouse into a chapel for five Detroit Tigers. Similar contrasts in the size of the Sox congregations and others have seized the attention of baseball chaplains across the country. ''Without question, chapel attendance among the Red Sox has been far and away more than any of the major league teams over the last two years," said Vince Nauss, president of Baseball Chapel. Trot Nixon, Mike Timlin, Tim Wakefield, Jason Varitek, Curt Schilling, Doug Mirabelli, Bill Mueller, Matt Clement, John Olerud, Mike Myers, Tony Graffanino, Chad Bradford: Each Sox player considers himself an evangelical Christian who believes in the sacred authority of the Bible and the promise of Jesus Christ as his savior. ''In terms of coming to Bible study and chapel, this team has more guys involved than any team I've ever been with," said Olerud, who has played for five teams over 17 seasons in the majors. The evangelical Sox believe in sharing the ''good news" of their faith, as they demonstrated after their remarkable comeback last October when they climbed out of a three-game chasm against the Yankees in the American League Championship Series and swept the Cardinals in the World Series. ''I wanted to be able to glorify God's name when all was said and done," Schilling proclaimed after he won Game 2 of the World Series while bleeding through his sock because of an experimental medical procedure that enabled him to pitch with a dislocated ankle tendon. Win or lose, Schilling and his fellow evangelicals said, the message remains the same. ''This is our platform, our place to speak our faith and live our faith," Timlin said. ''This is a special gift from God, to play baseball, and if we can spread God's word by doing that, then we've almost fulfilled our calling." Schilling and Timlin share a corner of the Sox clubhouse with Varitek, Wakefield, Mirabelli, and Bradford. Most of the other evangelical Christians occupy lockers across the room in a row with players who do not attend chapel. And the players who are not evangelicals have praised those who are for their inclusive influence. ''Everyone is very respectful of one another and what they choose to believe in," said Gabe Kapler, who is Jewish. ''The guys in this clubhouse live in harmony when it comes to that kind of stuff." Nixon suggested it would be sinful for Christians to do otherwise. ''It would be terrible for me or anyone else to look down on someone who may not come to chapel or Bible study," he said. ''We love and care about everyone a great deal." Indeed, the team's exceptional bond may have factored in its historic achievement last October. ''It does not surprise me at all that a team with such a special spiritual unity was able to accomplish all the record-setting things the Red Sox accomplished," said Joseph Price, a professor of religious studies at Whittier College who is writing a book, ''Rounding the Bases: Baseball and Religion in America." The Sox evangelicals said they often have been asked if they believe God wanted them to win the World Series rather than the Yankees or the Cardinals. ''I don't know what he thinks," Myers said. ''If I knew that, I'd be God." The evangelicals in the Sox clubhouse say they believe God wants them to glorify him by performing at their highest possible level. The rest, they say, is in the Lord's hands. So it was that Wakefield felt compelled to praise God even after the darkest moment of his professional career, when Aaron Boone homered off him in the 11th inning of Game 7 of the AL Championship Series to send the Yankees to the World Series in 2003. ''It's so easy to be thankful when you're on top of your game and everything is going right," Wakefield said. ''But when I gave up the home run to Aaron, I had to be thankful for that, too. It may have been God's plan to make me stronger for 2004." Wakefield said he ''accepted Jesus Christ as my Lord and savior" in 1990, the same year Olerud did. The conversion came in 1993 for Nixon, Mirabelli, and Myers. Schilling's occurred in '97, Mueller's in 2000. Each said they made the conversion for different reasons, though several cited the influence of their wives. And many said they changed their social behavior in ways that made them better husbands and fathers. Regardless of when they discovered their faith, the Sox evangelicals have converged at a unique time in franchise history. Nixon said the organization's religious tolerance has dramatically improved under the new ownership. Under the previous regime, Day was not allowed in the clubhouse, as he has been since former manager Grady Little helped clear the way after the team changed hands in 2002. Day's access to the clubhouse has increased his opportunity to meet with players. Previously, chapel was held outside the clubhouse, as it continues to be. ''That has made a huge difference," Nixon said. ''The organization has become more receptive to our faith." A number of the team's Latin American players also have attended chapel, but even some of those who have not been regular participants have expressed their spiritual faith. Manny Ramirez, for example, last year described in religious terms his reaction to the team trying to trade him to Texas for Alex Rodriguez. ''I thought to myself, 'I'll leave everything to God,' " Ramirez said. ''If God wants me to go to Boston, I'll go back. If he wants me to go to Texas, I'll go to Texas." ''We're trying to develop a player as a whole," Nauss said. ''We give Spanish-speaking kids English lessons. We give players lessons in how to deal with the media. What better than to also introduce them to the spirit?" Olerud said the Christian players serve as a support system, particularly on the road, where the seeds of many marital problems are planted. ''There are a lot of temptations on the road," Olerud said. ''Having a group of guys who share a similar mind-set helps you get through the season." It may also help them on the field. Nixon, for example, whose intensity sometimes has hurt his performance, said he has relied on God as a calming influence. In contrast, Timlin said his faith has helped him hone a more competitive edge. ''I'm generally not a mean guy, so I've had to make myself develop that persona," Timlin said. ''The Bible says God doesn't give you a timid spirit but a spirit of fire. In that sense, God has helped me be more competitive." Most of the Sox evangelicals provided testimony about the 2004 season for a DVD, ''Reversing the Curse," produced by Athletes in Action. They said in the program, as they did in interviews last weekend, that winning the World Series was less rich an experience than their relationships with God. ''I'm learning through Christ that I can become the kind of person I want to become," Mueller, who also won the 2003 AL batting title, said on the DVD. ''That's more fulfilling to me than any batting title or World Series." Nixon said in an intervew that he felt a brief sense of emptiness the day after winning the World Series because he had placed such a high priority on the achievement. ''I knew I had to put God on that pedestal [instead]," Nixon said. Day, who also serves as chaplain for the Patriots, has seen a common theme among professional athletes who turn to God. ''Some of these guys get everything they think they always wanted in life at a young age and then find that it still leaves them a bit empty," he said. ''They become more open to spiritual things and it can lead to a personal relationship with God." Most of the players arrived at chapel Sunday wearing their white uniform pants and red practice jerseys. They exchanged greetings and recited prayer requests to the rhythmic clang of metal on metal as one of their teammates worked out in an adjacent weight room. Outside, sausages sizzled, beer flowed, and street entertainers plied their crafts amid the pregame hurlyburly. By the time Day offered his closing prayer, the worshippers were less than 40 minutes away from renewing their pursuit of a second straight world championship. As they bowed their heads, Day exhorted them to think big. He implored them to seek ''the truth of life that goes above baseball and success." David...thanks for posting this one. I have a lot of friend from Boston...die hard Red Sox and Patriot fans. In fact they've even converted me. I forwarded on my Boston Boys.